The first stage of the Black Death among Europeans was said to begin with the whoosh of a Mongol trebuchet. Gabriele De’ Mussi, a lawyer from near Genoa writing in about 1348, is believed to have recorded the account of the earliest use of plague as weapon of war at Caffa in 1346. 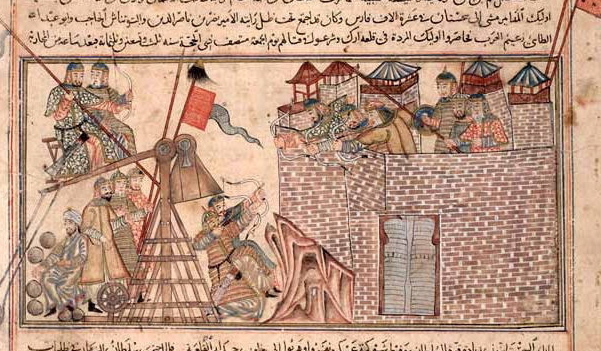 This is a mongol style siege but not the siege of Caffa from the early 14th century Jami al-Tawarikh (Compendium of Chronicles) by Rashid ad-Din. Edinburgh University Library via Wikipedia Commons. “The dying Tartars, stunned and stupefied by the immensity of the disaster brought about by the disease, and realizing that they had no hope of escape, lost interest in the siege. But they ordered corpses to be placed in catapults and lobbed into the city in the hope that the intolerable stench would kill everyone inside. What seemed like mountains of dead were thrown into the city, and the Christians could not hide or flee or escape from them, although they dumped as many bodies as they could into the sea. As soon as the rotting corpses tainted the air and poisoned the water supply, and the stench was so overwhelming that hardly one in several thousand was in a position to flee the remains of the Tartar army. Moreover one infected man could carry the poison to others, and infect people and places with the disease by look alone. No one knew, or could discover, a means of defense.” (Horrox, p. 17). As Mark Wheelis observes in his 2002 article, infected corpses flung into the fortress by trebuchet are a plausible means of infecting the inhabitants. It is not unlikely that corpses would be flung into fortresses, as a terror tactic, with or without disease. Imagine being besieged for months and then having rotting corpses flung at you. By choosing the strongest smelling corpses, it is likely that when they were hurled they came down hard and very sticky. Body fluids can certainly spread Yersinia pestis to people with abrasions and the mess these would have caused upon landing would draw rats from within the fortress. Rats will feed on dead corpses. Direct contact may account for more medieval cases of plague that it is generally credited; in the United States, direct contact is the likely form of transmission for 20% of cases between 1970 and 1995 (Wheelis, 2002). Wheelis suggests that this had an additional bonus, helping the Mongols (Tartars) deal with the mortuary problem that plague always causes. While it is possible that rat transmission brought the plague into the fortress, there is no reason to doubt Gabriele De’ Mussi’s association between the flung corpses and the beginning of the outbreak. Gabriele De’ Mussi is also revealing his own thoughts about contagion and transmission. Following the miasma theory of contagion, infection is passed through the contamination of the air and water/food. According to Gabriele De’ Mussi, “intolerable stench would kill everyone inside”; the contagion is in the foul-smelling air that can also permeate and therefore contaminate food or water. Although he recognized that it could be transmitted person to person, it was done “by look alone”. Without understanding germ theory, they could not understand what was actually being passed but did recognize respiratory and oral routes of transmission. Using corpses to foul land or water is a method of biological warfare that is probably as old as warfare itself. If you read all of Gabriele De’ Mussi’s account, he is not really condemning the Tartars (Mongols) as doing anything out-of-bounds or evil. To Gabriele, God was striking down both the Tartars and the Christians. It is unclear if the Tartars were using the corpses as a tactic of biological warfare or as an act of terrorism and desperation, a ‘share the pain’ or revenge tactic. Gabriele De’ Mussi says “realizing that they had no hope of escape, lost interest in the siege” and then began to fling the corpses. At this point the Tartars had nothing more to lose. Unlike virtually every other biological warfare strategy, the Tartars did not have to be concerned with the greatest risk of biological warfare, blow-back, that is, the infection of your own army. Although many Italians fled the fortress, it remained under Italian control and the Tartars did abandon their siege (Wheelis, 2002). Far from blaming the Tartars, Gabriele De’ Mussi places the responsibility for bringing the plague to the Mediterranean squarely on his own people, the Genoese and Venetians. Wheelis argues that Gabriele De’ Mussi must be mistaken that a single or few ships fleeing from Caffa brought the plague to Europe. He notes that the spread into the Mediterranean shown in the figure below took too long for a direct voyage from Caffa to Italy. Wheelis points out that this is probably the work of multiple streams of infected ships. He also suggests that caravan routes over land did spread plague to the south of Caffa, though as his maps shows, not nearly as effectively as by sea. Wheelis concludes that “the siege of Caffa, for all its dramatic appeal, probably had no more than anecdotal importance in the spread of the plague, a macabre incident in terrifying times.” Perhaps, but Gabriele De’ Mussi’s rhetoric may be read in other ways. Gabriele De’ Mussi deploys a dizzying array of rhetorical devices to express the trauma and tragedy of the plague. He is inconsistent in his point of view, sometimes writing as through he were at Caffa or on the fleeing ship, other times writing from a distance. As Wheelis notes, Gabriele De’ Mussi did not leave Italy during this years. The entire treatise is wailing to God over the tragedy, and at times talking directly or even conversing with God. When Gabriele De’ Mussi writes that “we Genoese and Venetians bear responsibility for revealing the judgements of God”, he is not referring to a few refugees. This seems to be an indictment of an entire people and could reflect transmission of the plague through the Italian trading network. It should also be considered that ships carrying refugees from the East had a powerful symbolic importance to Italians. Mythologically, the Romans claimed descent from Aeneas who led refugees from Troy to Italy where they won a home. Just as refugees from the East founded the Roman people, Italians fleeing from the East have now brought destruction to Italy and all of Europe. Gabriele De’ Mussi does not mention Aeneas, Troy or the founding of Rome but simplifying his story of plague transmission to a few refugees fleeing from the East makes his story more powerful. Although refugees from Caffa may have only been one stream of disease transmission, ships from Caffa could have been important for two reasons. First, ships from Caffa could have been a primary disease stream even if they didn’t directly reach Genoa or Venice. Following what we now know about super-spreading phenomena a few ships stopping at multiple ports could radically effect transmission dynamics as plague entered Europe. Additionally, at least in Genoa and possibly Venice, the events at Caffa and its refugees formed a foundation narrative for a tragedy of biblical proportions. A few survivors from Caffa who eventually made their way home, possibly changing ships multiple times, may have arrived about the same time as the plague with horror stories of the plague in ships and ports along their route. Horrox, R. ed & trans. (1994) The Black Death. Manchester Medieval Sources series. Manchester and New York: Manchester University Press.